Using color in food photographs creates a setting that complements your food subject. Color can also affect how people feel about a food image. The feeling can be soft and comfortable, bold and powerful, or perhaps somewhere in between. 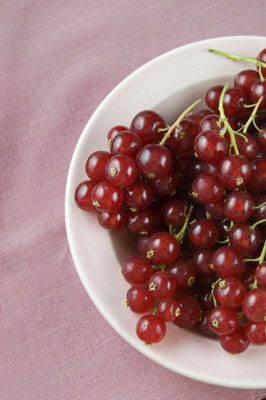 A pink background provides just enough color for these red currants. The whitewashed look is a great look for a food dish that’s quite appealing. This light-flooded look is the de facto aesthetic standard for many food and lifestyle magazines. 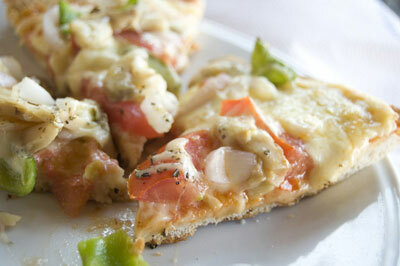 The look makes ordinary food appear a bit dreamy and altogether appetizing, as you can see in the following figure. The whitewashed look includes a very light-colored background, which may be coupled with light linens or dishes. These elements can be pure white, off-white, faded colors, or pastels. And a key part of the look is lots of beautiful light. Although you can use a good artificial lighting setup, natural lighting is a perfect fit for the whitewashed look. The whitewashed look is all about a light and dreamy feel. In general, warm colors are the yellows, oranges, and reds from the color spectrum. Using soft, subdued versions of warm colors for backgrounds, dishes, and linens promotes the feeling of warmth and comfort in an image. A soft yellow napkin under warm apple compote or a subdued brown tablecloth under a dish of macaroni and cheese creates an image that defines comfort food. In the following figure, the fruit pastry has a lot of soft reds and pinks in the subject but then pulls the warmth in from the yellow and brown of the table. This image uses a single source of light, from a small window. 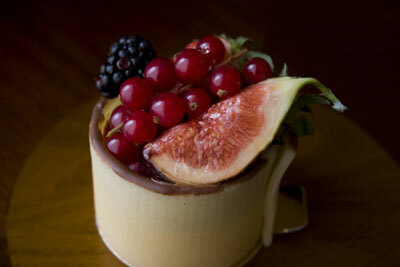 This photo of a fruit tart with marzipan creates warmth. You can create some mighty powerful images by using bright colors in your food photography settings. Strong, colorful backgrounds can really set off delicious candies or cocktails, sorbets, cupcakes, or the like. These images are graphic, bold, and really fun! When working with strong, bold colors in your food images, make sure your food subject is neutral or every bit as bright as the colors in your props. A pale pastel subject with a popping graphic background can look a little mismatched.